The Estheticist is a monthly, free visual arts advice service. 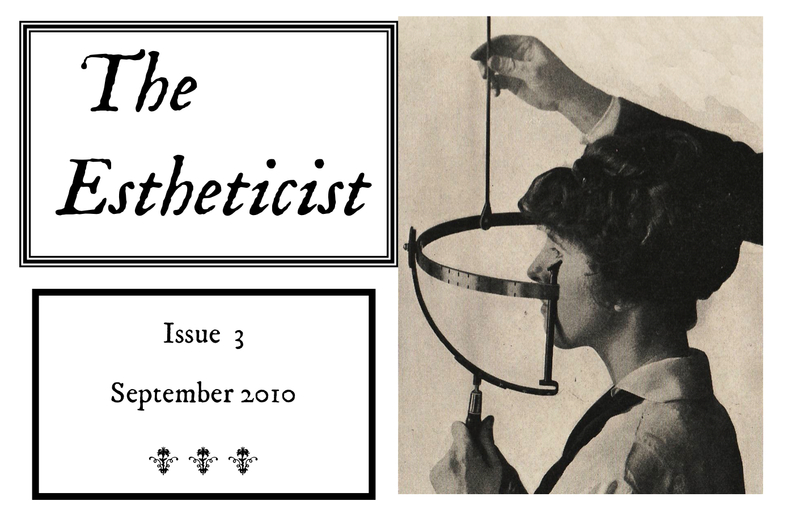 To submit a question, write to estheticist [at] aol.com. Questions may be published as part of this montly blog. All questions will be answered and treated anonymously. As artists we have the privilege of offering our colleagues artworks in exchange. Are there any unspoken rules about artists bartering pieces? For instance, shall this works have dedication? Or is it right to sell a piece which was acquired in a friendly exchange? Thank you for your advice. Exchanging pieces amongst artist colleagues is a wonderful practice. To propose an exchange, however, has to be done carefully and with tact. For an artist to propose a trade with a more successful — or expensive, for that matter —artist, would be presumptuous and would place the more successful artist in an uncomfortable situation. Artists at the same level can certainly and freely propose trades to each other, but the interest in each other’s works must be clearly mutual as well as the recognition that both are at the same level (which is actually hard to do as most artists have a slightly more aggrandized vision of where they are placed reputation-wise in relation to others). The best opportunity to propose a trade most typically emerges when an artist that one admires expresses a lot of interest for a particular work of yours; it is then perfectly reasonable to suggest a trade. One should not be picky either: to demand a particular work from the collection of that artist would tarnish the exchange. Regarding dedication: unless the dedication is considered as intricate part of the work (and some conceptual works are that way), in general to visibly dedicate the piece to someone else (say, an editioned photograph) would likely diminish the value of the work when this one may be passed down to posterity — it certainly would be of less interest to a museum unless both donor and recipient would become historically famous ( and let’s not kid ourselves that we will be, say, Matisse giving a gift to Picasso). And regarding sales: it is not appropriate to sell a work that one has acquired through an exchange of this kind. When one enters into such a trade, the implicit understanding is that admiration to each other, not monetary gain, is the reason of the contract. To choose to sell a work that one received this way is to admit that the admiration that one may have toward that artist is not as great as your desire (or need) to cash in. Regardless of how desperate one may be for the money, the gesture of this artist will not be seen favorably amongst those around him/her, will likely offend the author of the piece, and will likely prevent others from trading with this artist in the future. I am an artist who has been around for a while so I am reasonably well-known and connected in the art world. Also as a result, many younger (and not so young) artists ask me for letters of recommendation for grants and residencies. While I want to help them, writing these recommendations is way too time consuming, I am a slow writer, and sometimes I am just overwhelmed by the amount of requests that I get. Moreover, there is one person in particular who every year asks me to write a recommendation for something and I am just fed up with it. How can I let this person as well as others know that I am not endlessly available to write letters without sounding rude? This is a very common problem, but it is not difficult to address. You, however, will have to learn how to say no. One way to do it is to set your seasonal limit (say, three letters) and award those letters to those artists who you consider more worthy. It is perfectly fine to tell others, nicely but firmly, that while you would love to help them you are simply unable to write a decent recommendation because of lack of time. And regarding the artist who constantly solicits you, you should have no qualms in telling him/her that you will have to give the opportunity to others instead than to the same person. Needless to say, not everyone may be so understanding to your negative, but I would be that those same people will also likely be those who don’t understand the meaning of boundaries anyway. I was a photojournalist for many years, until I became disenchanted with the profession. Disenchantment was followed by an identity crisis, followed by a revelation; I wanted to become a full-time artist. I’ve been dabbling in drawing, painting, collage and conceptual photography for many years now, but kept these activities as a private, personal joy. I live in an art world capital with a thriving art scene and I’m thinking of taking some courses here and there, start going to vernissages and mingle, make some connections and start making art (and hopefully a name for myself). The thing is, I’m 37 years old and I never had any art related training whatsoever, which gives me extreme insecurity; I’m just not confident of my skills or my work. I’m reluctant to pursue an arts degree now, as I believe I’ve wasted so much time (I’m kicking myself for not having this revelation when I was 18 or 20 years old). I have a constant fear of not having enough time at this point in my life to develop a successful career as an artist. What should I do? Should I invest five (or more) years studying and then try to start when I’m 42 or older? Or should I trust that a few courses and good connections will help both my skills and my confidence? You seem to be able to assess your situation with great frankness and objectivity; that in itself puts you in an advantage in relation to others who, even if they decided to become artists before you, would benefit from feeling a bit more insecure about their talent. Secondly, I think you have correctly guessed that it is not a good idea to make art in a vacuum. Although we still hold the romantic notion that an artist may make art in secret and one day be discovered after death (e. g. Henry Darger), the reality is that contemporary art is as much the result of the perseverance of one’s vision as the product of the dialogue between artists, between generations, between world views. So it is of utmost importance for you to place yourself within a community of artists. Attending some sort of art program, classes, residencies, and even art school would be indeed very beneficial for you, to see how others think, solve similar problems, how they articulate their work toward others, and how you share or differ in your views on art. Do not worry about your age: while it is true that you will not have the same learning arch of a 20-something, at the same time you arrive to art with valuable life experience, which you can put to good use in the creation of thoughtful and original work. Also, remember that many very important artists started making art fairly late in their career: Marcel Broodthaers, one of the most influential post-war artists, was a poet and made his first art object at 40. W. G. Sebald, one of the most influential European authors, published his first work in his 40s. Such examples abound. And you should not be concerned about running out of time. Your focus should be to become the best artist you can be, and to find reward in the work that you make. While urgency can be a productive motivation to get to work, you should not let it turn into haste. I work at an alternative art space. Part of my job is to solicit artwork donations from an artist roster we have for our annual benefit. Whlle some of these artists in this roster have exhibited as part of our regular exhibition schedule in the past, others have never been invited to do so. One of them complained to me about our solicitations, saying that she has been already asked for several works in the past and that it is hypocritical of us to request donations when we have not shown interest to exhibit her work. My view is that this is indeed an opportunity for artists to get their name out, and that our space can’t possibly show every single artist’s work and thus it is valid to ask for help to those in the art community who attend our space, even if they are only spectators. Who is right? She is right. By soliciting free artworks for a benefit to artists who you have not included (or are not likely to include) in your regular exhibition schedule, you are sending the message (intentionally or not) that you have a double standard in artwork selection, and that this artist belongs to the category of those who are good enough to exhibit at the benefit (which is usually not a very exciting context to show a work anyway) but not be included in the regular shows. I am sure that you have plenty of artists who have indeed exhibited at the space that you could limit your benefit solicitations to them. It is true that you will never be able (nor would ever want to) to exhibit every single artist who visits your space, but if the art community that you are supposed to service is feeling taken advantage of, you have a real problem in your hands and it is your duty to find ways through which these artists will feel, even if not supported, at least treated respectfully. I am an American artist and have been working with a “personal virtual assistant” from Bangalore to create a project that not only reflects the uneven conditions of the relationship, but also makes attempts to balance out the power dynamics of the relationship by treating my “assistant” like a person, making his interests the content of our work together, and even asking him to assign me tasks. The project has been extremely fulfilling and problematic – right where I want it to be. I have an exhibition planned of the work we have done together, and I’m wondering what you think the best way might be to allow for the relationship be alive during the exhibition. Thank you for bringing up such an interesting and problematic case —which appears to be a classic ethical dilemma in social practice. First, let’s review the facts: you are an artist who has hired a service. The individual who works for the company and, by extension, for you, is bound to a contractual relationship to which his financial subsistence depends. Even if he enjoys what you are asking him to do, or even if he plots these ideas with you, the relationship is rooted in two unaltered facts: he is doing it as part of a job, and you are his boss. Because of these facts, the relationship artist-assistant is not significantly altered regardless what you ask him to do. Your desire to disrupt, or expose the power relationships that emerge from globalization is well noted. However, just for the sake of argument: even if this exchange is based on a democratic creative dialogue where you both make aesthetic decisions, it would not be a collaboration, because since your collaborator is likely not a visual artist versed, invested nor inserted in the international art circuit as I would assume you are, even then you will end up getting the credit, and he will remain in the background as an enhancing ingredient to your career. The reason for this is that the kind of benefits that you are getting from this relationship are tangible but invisible— they are of the reputational economy type: you may appear publicly as a generous or democratic individual, but in the end because you are the one who is bringing this man into your cultural context you are the one to benefit. In my view, the only way to truly balance the power dynamics of this relationship would be to not make the outcome of the project an exhibition in your cultural playing field (that is, the artworld, america, etc.) To do so would first tilt the project in an advantageous light toward your own practice, and make the assistant look less than a real person and more like a human readymade, which is what these companies sell anyway. Where you, for instance, to revert the hierarchy and ask him to assign you tasks, or to perform tasks that his friends are doing for other bosses in the U.S., you would be into more interesting territory. And to truly level the relationship, your financial or artistic subsistence should depend on his decisions and suggestions — for instance, having him decide what your art should be like in the next year or so, without you revealing to others that you are taking instructions from him. Or starting your own reverse company, doing the kind of work for free for the personal assistants in Bangalore who service these American companies. Or just becoming the free personal assistant to any random person in Bangalore. Or do like Marina Abramovic who exchanged jobs with a prostitute in Amsterdam for a day. Etcetera. These courses of action would be in my view a more complementary (and complimentary) alternative to simply exhibiting the projects that you had your virtual assistant do. This is not to say that it is not valid to retain your artistic authority in this relationship (Santiago Sierra, for instance, exploits people but he is direct about it, even if it may be an unethical act). The problem is that you have created a situation where the artist-assistant relationship you propose to problematize may not appear to go so far as to truly upset the balance. What matters here is conceptual transparency and the kind of stakes that exist on both sides. Without carefully addressing both in your presentation, you risk appearing to simply extend that which you appear to criticize or only half-heartedly exposing your personal risk in a power relationship. I would like to ask you where would we be right about now art-wise if Renaissance had never happened – if we had skipped it altogether? Marxists historians would point out that during the Renaissance the emergence of a bourgeois class (e. g. Medici) with time for leisure and education led to art as a product that could be bought and collected. Furthermore, the emphasis on man as the measure of all things (as opposed to God) has, amongst other consequences, the phenomenon of constructing the notion of “The” artist. With Vasari’s “Lives of the Artists”, this notion is first articulated, and, one would argue, the tendency of narrating art history through the canonical narrative of individual “geniuses”. Fast forwarding to our era, we can all agree that we continue to regard physical artworks as carriers of intrinsic value (both symbolic and financial) and that we continue to nurture the notion of “The” artist (now as in “art star”), both legacies of the Renaissance. So, what would have happened if the Renaissance hadn’t occurred? Perhaps we can find part of the answer in societies that did not participate in, or exist outside of, the construction of Western modern culture (indigenous cultures around the world, religious movements, outsider artists, etc). For some of these people, art is the expression of a collectivity, but it should not have financial value. Some recognize that great artworks can be created by individuals, but don’t necessarily appreciate or favor an self-centered vision but instead how this work speaks to the group. And in some societies what we call art is not called art and artists are not considered artists in the same way in which religious icons in churches in medieval times were not seen as containing an aesthetic value outside of its expression of faith and the artists were anonymous (until Giotto came along). In other words, interpreting the view of authors like Arthur Danto, without the Renaissance we would not have had a beginning of the art historical arch, we would not have had a modern era, an academy, a modernism, a post-modernism, and the death of art. Art today would perhaps not be called art. Museums as spaces where to show these things would not be considered necessary. People would make art, but not necessarily sell it or collect it, and this art would perhaps not be about their vision but would perhaps be collectively made or anonymous. And we would have lost the chance to have a Sistine Chapel. But we would have likely also been spared from Damien Hirst. What makes an Art object meaningful? it the indication that something meaningful is present? Is it the attention we proceed to invest in it? Is it our capacity to subsequently rationalize that experience into a communicable verbal analog: to describe it in words? Is it in the act of communication? Your question lies at the core of epistemology and it is the source of a large debate between proponents of different schools of thought. From the standpoint of hermeneutics, what makes an artwork meaningful is the successful mediation of a force between the viewer and the object, some kind of “third” force that, if successful, disappears when the connection takes place (the most common example is language: when we speak about an object language help us attain meaning, but at the same time recedes into the background because we are not conscious that we are using it). Structuralism, by contrast, argued that meaning only can come when you utilize a signifying system —could be feminism, anthropology, political theory, semiotics— to approach an object, and because of the many variables of systems and individuals, meaning is an unstable product. In art museums, an influential approach has come from constructivist theory, which draws from hermeneutics in that it sees the reaching of meaning as a mediated process, and from structuralism in that it is relative to the interpreter. It also places most emphasis on the experience of the viewer as the main constructor of meaning. In any case, most art education theorists would agree that there are likely a myriad of reasons why an art work becomes meaningful. Objects can be meaningful to us without us having to verbally articulate why. They also become suddenly meaningful when we hear others speak enthusiastically about them. But meaning ultimately is an internal negotiation within yourself, when you process all the information you have received of a particular object and, be it for the suggestibility of the context around you, irrational impulse, or careful reflection on the issues that it poses in your mind. And because the conditions that create it are never fixed, it is unpredictable what may become most meaningful to an individual. Social and cultural conditioning may cause us to agree that a particular art work is very meaningful, but even then we usually disagree on the reason why. What do you do when you realize that you are being been stalked, used and vampirized by a so-called friend, some one much younger than you? How do you let the world know that you reject this person? I confronted my friend but he reacted surprised, as if I was mad. I feel as if I was in the “All about Eve’ movie, surrounded by pathological narcissists on coke. I want to escape! Help, please! It would be easier to help you if your letter was a bit less opaque in the details. I gather that by being “vampirized” and “stalked” you are referring to a colleague who has taken advantage of your friendship, perhaps plagiarizing your works or using your friendship for advancing their personal career. The fact that they sound like drug-addicts is not promising either. Whatever is the case, it is clear that you have surrounded yourself with people that are detrimental to your well-being and your creativity. But as bleak as your surroundings may look, it is very important for you to know that they don’t represent the totality of the art world: there are valuable people out there that will value and support you as a friend and as artist. Your job is to find them and surround yourself by them in a better environment. Whether that means to simply cutting all ties to your torturer, or to move to another neighborhood, town, or country, is only that only you can decide. But this change will likely require that you drastically change your life as it is- expand your professional circles of friends and acquaintances, seek out the individuals you admire, build a group of people who share your same values. Usually we blame the others for our own inability to change our situation, but as you yourself suggest this situation has now become untenable and you are the only one who can change it. Your priority right now should be to sever all ties from those who have caused you this aggravation, and have the discipline not to contact them again. You can’t move on to meet and develop good relationships because you are too involved with the poisonous ones. Finally, I suggest that your focus should be to make art, not to worry what others think about you. This focus will ultimately be rewarded. To the “tired recommender:” A VERY common thing is to just have the students write the rec’s themselves, then you just edit & sign off on them. I feel like I always offer to do that for the people who I ask to “write” letters for me because I just assume they’ll be busy. Simple solution!